test results or link to them. ... ... @@ -163,6 +163,8 @@ A project is merely one of the projects defined for this patchwork instance. 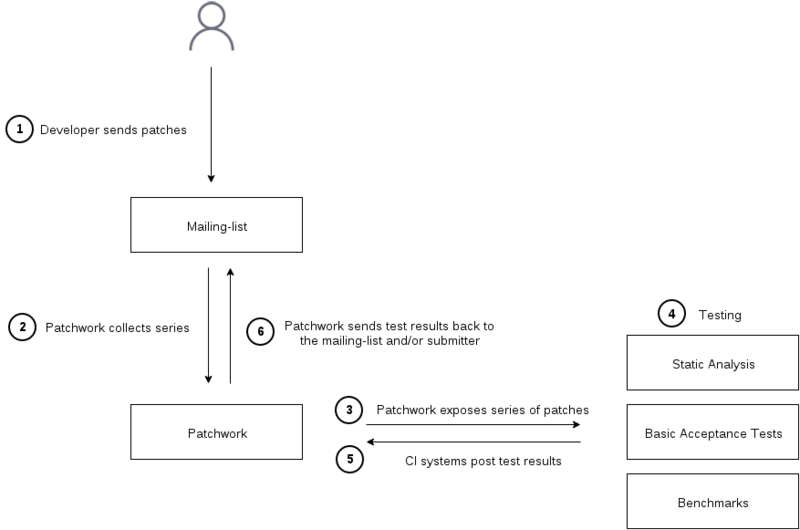 Patchwork can be used in conjunction with tests suites to build a |CI| system. Details about steps **1** and **2** can be found in :ref:`submitting-patches`. the mailing list through the ``series-new-revision`` :ref:`event <rest-events>`. that ``since`` parameter is the ``event_time`` of the last event seen. :http:post:`/test-results/</api/1.0/series/(int: series_id)/revisions/(int: version)/test-results/>` entry point. user their patches have been picked up for testing. No test result email should be sent out (default). Test result emails are sent to the patch submitter. appended to the ``To:`` and ``Cc:`` fields. Always send an email, disregarding the status of the test result. Only send an email when the test has some warnings or errors. look at the `git-pw source code`__. test scripts without resorting to using the REST API. command. The output is one event per line, oldest event first. something with it, test a new revision for instance. results back. Here as well |git-pw| provides a command to simplify the process. Remember it's always possible to directly use the REST API. Linux checkout before running the test.